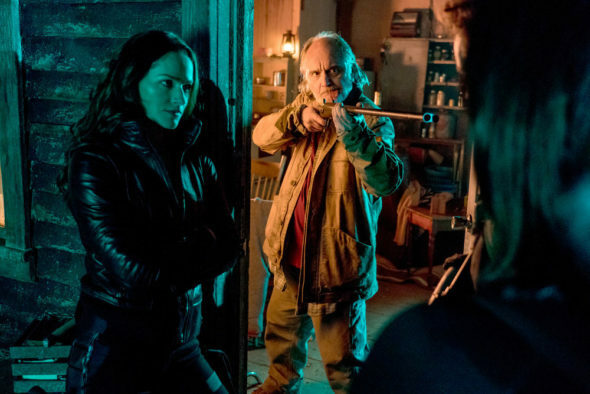 Does the third season of the Van Helsing TV show on Syfy still have enough bite? As we all know, the Nielsen ratings typically play a big role in determining whether a TV show like Van Helsing is cancelled or renewed for season four. Unfortunately, most of us do not live in Nielsen households. Because many viewers feel frustration when their viewing habits and opinions aren’t considered, we’d like to offer you the chance to rate all of the Van Helsing season four episodes here. A Syfy horror fantasy, Van Helsing stars Kelly Overton, Jonathan Scarfe, Christopher Heyerdahl, Missy Peregrym, Vincent Gale, Rukiya Bernard, Trezzo Mahoro, and Aleks Paunovic. It centers on Van Helsing descendent Vanessa “Van” Helsing, who awoke from a coma to find vampires have overtaken the world. Since Van has a unique blood composition which makes her immune to vampires and allows her to turn them into humans, this vampire hunter is their prime target. In Van Helsing, season three, after being bitten by a shape-shifting Elder vampire loyal to the Van Helsing clan, Vanessa is once again resurrected. Now she must confront her family’s legacy. Meanwhile at Crooked Falls, Axel (Scarfe), Scarlett (Peregrym) and the others fend off Blak Tek’s forces who hope to add Scarlett to their list of lab rats. What do you think? Which season three episodes of the Van Helsing TV series do you rate as wonderful, terrible, or somewhere between? Should Syfy cancel or renew Van Helsing for a fourth season? Don’t forget to vote, and share your thoughts, below. 12/18/18 update: Syfy has renewed the Van Helsing TV show for a fourth season. Details here. More about: Van Helsing, Van Helsing: canceled or renewed? Renew …. End of …. Do not cancel, but focus more on hunting the elders than filler episodes….it makes it slow and boring. Van Helsing is a great show! I love the original stories and plot twists. Don’t leave us hanging in this apocalyptic world. Please Renew Van Helsing for a Season 4! The show is a good one, one of the more original shows on TV right now. It should stay on the air for as long as possible. Renew it for another season.